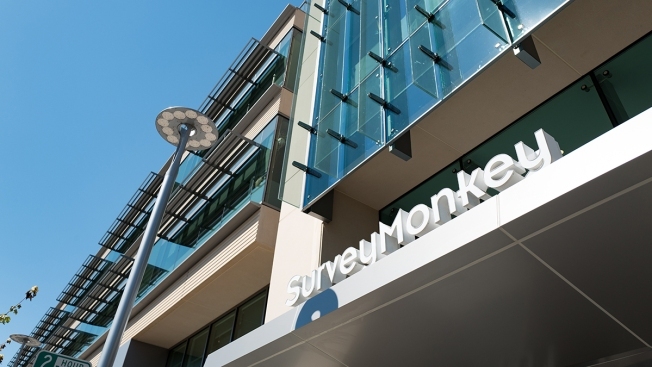 This Aug. 25, 2016, file photo shows the logo and signage at the headquarters of online survey company SurveyMonkey, in the Silicon Valley town of Palo Alto, California. SurveyMonkey soared more than 60 percent in its stock market debut Wednesday, after opening at $18.75 per share. The software company that offers digital survey and data analytics services for enterprise and personal use priced its shares at $12 a piece Tuesday night, above the expected range of $9 to $11. It also increased the number of shares up for sale to 15 million from 13.5 million, raising $180 million. The stock — under the company's formal name, SVMK Inc. — trades on the Nasdaq under the ticker symbol "SVMK." It rose above $19 in the stock's first few minutes of trading. CEO Zander Lurie told CNBC's "Squawk Box" earlier Wednesday that SurveyMonkey handles more than 20 million answers from over 3 million people every day and that the company pays "great heed" to consumer privacy. In August when it first filed to go public, SurveyMonkey reported a $27.18 million net loss on $121.2 million in revenue for the first half of 2018. The company narrowed its losses from 2016 to 2017, according to the filing. SurveyMonkey is a four-time CNBC Disruptor, ranking 14th on this year's list. The public offering comes close on the heels of an Eventbrite IPO last week. The online ticketing company gained 60 percent in its first day on the public markets. The lead underwriters are J.P. Morgan, Allen and Co. and BofA Merrill Lynch. —CNBC's Jordan Novet, Berkeley Lovelace and Leslie Picker contributed to this report.